A few months back I started a new job with a much greater focus on development work over IT systems management. Unfortunately this has led to a pretty big drop off in amount of time spent on personal side projects, but happily my new employer is fully supportive of open source and I am able to release much of what I work on to the wider community. THESE PACKAGES DO NOT MATCH THE HASHES FROM Pipfile.lock!. If you have updated the package versions, please update the hashes. Otherwise, examine the package contents carefully; someone may have tampered with them. Hash checking and Pipfile.lock are a part of the pipenv toolchain and meant to verify the integrity of packages being installed. Committing the lock file is recommended practice and generally something I have not had many problems with. There are some old tickets on GitHub reporting issues with this hashing between operating systems, but the latest versions of pipenv supposedly do not have these problems. Why is this user getting a hash match error? I had a Pi lying around, so I decided to try replicating the issue. Many hours later, I got Baby Buddy up and running on my (second) Pi and learned a lot about the Python packaging process and how it can go wrong on ARM devices. This post is part of the series, Advent of Code 2017, where I work my way through (part of) the 2017 Advent of Code challenges in order to re-learn some of the basics of Python and reflect on some simple concepts and functionality. All my challenge code is available in cdubz/advent-of-code-2017 on GitHub. This all takes a little over half a second, as opposed to the 133 days of processing that would be needed to run all one billion permutations. Phew! I fought with how to create and navigate a hexagon grid for a bit before I stumbled on an extremely useful post by Chris Schetter: Hexagon grids: coordinate systems and distance calculations. Working in 2d grids (with four possible movement directions) in Python is fairly easy with some dictionaries, but a hexagon grid means there are six potential directions and simple calculations of x,y coordinates won't quite get the job done. What Chris explains so well is a simple concept: flip the grid and add a z-axis. Another simple revelation on built-ins from this challenge: the key argument can be used to modify what is evaluated by the max function. This concept is explained in detail as part of the accepted answer to this Stack Overflow post: python max function using 'key' and lambda expression. 3  # This is the *maximum value of the dictionary's keys*. 2  # This is the *key of the maximum value in the dictionary*. I taught myself Python a few years ago by following the wonderful Learn Python the Hard Way (LPTHW) series by Zed A. Shaw. Since then, I have spent a decent amount of time in Python largely in the Django framework. Django is a lot of fun to work with because it abstracts away much of the complexities of developing a full-featured web application in Python. In this way, however, it has also led me to forget some of the basic Python that I learned through LPTHW. In order to recapture some of those early lessons (and maybe learn a few more Python 3 specific ones), I worked through (part of) the 2017 Advent of Code, a 25-day, language agnostic programming challenge series developed by Eric Watsl. I originally thought about using the series to learn a new language, but eventually realized that I still have a long way to go in Python. This series explores my (often very basic) revelations and lessons learned while completing 20 of the 25 days of challenges (vacation travel cut the series short for me). The code I used for each day is available on GitHub. Also check out the advent-of-code and advent-of-code-2017 GitHub topics to see the many solutions people have developed in various languages. I was recently shopping online for a specific type of lotion (my skin seems to hate all other types). I am somewhat predisposed to avoid Amazon.com because its size and increasing dominance of online shopping concerns me as it moves closer and closer to "shopping" (in the sense that "searching" means Google to most people). However, my biggest reason for avoiding Amazon.com is simpler: it has become incredibly confusing to shop there. Searching for just about anything will yield thousands of results and it takes (me) a lot of effort to determine which one is appropriate. This can be a great thing in a lot of cases, but more often than not it feels more like navigating a minefield of deceitful listings than comparing competing products. This lengthy post evaluates one example - Aveeno "Daily Moisturizing" lotion. As with most personal care products, when searching online I pull up a couple of websites to compare prices. In this case I pulled up Amazon.com last, searched for "Aveeno" and was impressed to see just what I was looking to compare (the 18 oz., non-SPF version) as the first result. I clicked through and, curious to figure out the price per ounce, looked to the "add to cart" area. What are are my options? Sizes select list with 37 sizes. Styles (??) select list with three styles. "Subscribe & Save" (pre-selected) and "One-time purchase" radio buttons. "Delivery every" select list (2 months pre-selected). 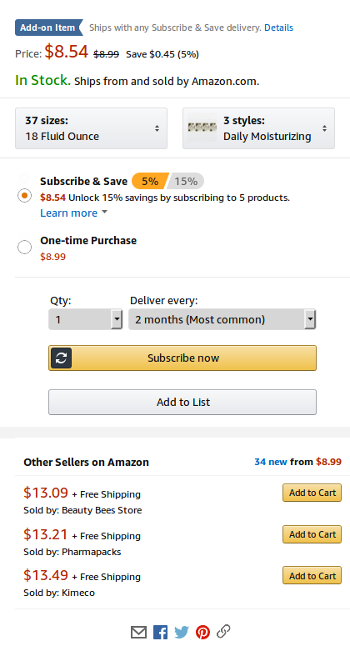 Three "Add to Cart" buttons with different prices. Formatted to plain English: Yes, this is a really long request URL but we are doing it on purpose. We are scanning for research purpose. Please have a look at the user agent. Thanks! What does the user agent for this request have to say?